The presidents discussed allegations of Russian interference in the 2016 US presidential election at the talks today. 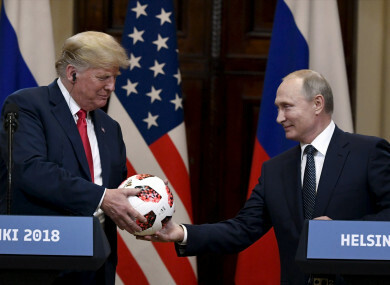 Russian President Vladimir Putin presents a football to US President Donald Trump. US PRESIDENT DONALD has declared that his historic summit with Russian counterpart Vladimir Putin has changed the relationship between the two countries. The night before the talks Trump said that the relationship between the US and Russia has never been worse. However speaking at a joint press conference in Helsinki today, Trump said the meeting was a constructive dialogue that opens new pathways to peace. He said that relations between the US and Russia changed during the summit and it marked the beginning of a longer process, which will feature strong dialogue with Russia. Putin said the discussions were “frank and useful”. He added that the talks reflected a desire to restore trust. Putin said that Trump brought up the allegations of Russian meddling in the US presidential election in 2016 and he replied that Russia never meddled in any election. “We had a good conversation and I hope we now understand each other better,” he said. Trump said that Russia wants to end the problem of nuclear proliferation. He added that he emphasised the importance of pressuring Iran. In response to a question from a reporter Trump said there was no collusion between his campaign and the Russian government. “There was no collusion I didn’t know the president to collude with him,” he said. I beat Hillary Clinton easily… We ran a great campaign and that’s why I’m president. Those comments were reflected by Putin who said allegations of meddling are “complete nonsense”. He said that if the Mueller investigation, which is probing the collusion allegations, sends Russia an official request to question suspects then Russia will do that. “But, in return, we would want to question US officials who we suspect of illegal acts against Russia,” he added. The two men also addressed rumours that Russia compiled a dossier of compromising material against Trump while Trump was in Moscow with the Miss Universe Pageant. Putin described the allegations as “nonsense”. “I did hear these rumours. When President Trump visited Moscow back then, I didn’t even know he was in Moscow… Nobody informed me that he was in Moscow… Please disregard these issues,” he said. Trump said that if there was compromising information about him it would have come out long ago. The press conference sparked an outpouring of reaction in the US. Republican senator Lindsey Graham said that Trump’s failure to hold Russia accountable for meddling in the 2016 election was a “missed opportunity” while John Brennan, CIA director under Obama, described it as “treasonous” on Twitter. CNN news anchor Anderson Cooper described it as one of the most “disgraceful performances by an American president” ever. Moments before the press conference got underway a man holding a sign reading ‘Nuclear Weapon Ban Treaty’ was forcibly removed from the venue by security guards. CNN reporter Jim Acosta, who was in the room, said the man had identified himself as being from progressive magazine The Nation. Acosta said the man then produced the sign again and that officials had grabbed him and escorted him out. Email “Trump says the US relationship with Russia has changed following his meeting with Putin”. Feedback on “Trump says the US relationship with Russia has changed following his meeting with Putin”.